Are you looking for a unique Arabic tattoo design? Something special that no one else has? Are you afraid you might get a tattoo that is wrong, or worse, a tattoo that says something offensive?! 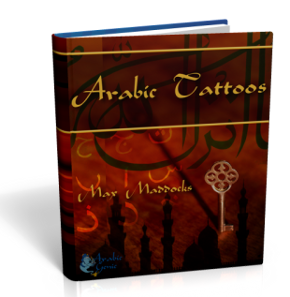 Well, look no further: my digital book Arabic Tattoos is choke-full of tantalizing Arabic tattoo designs that have been translated by professionals. What Arabic tattoo are YOU looking for? Arabic Tattoos has something for every taste, with beautiful designs ranging from simple words such as “love”, “determination” or “magic” to more elaborate phrases such as “a friend in need is a friend indeed”, “live each moment of your life as though it were your last” or “seize the day”. Perhaps, you’re interested in getting an Arabic tattoo of your star sign? No problem, my book contains all the 12 star signs. 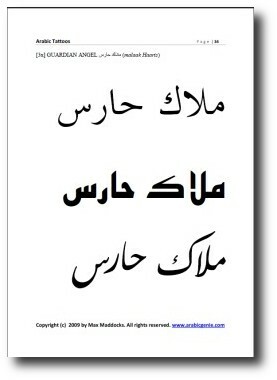 Or maybe, you want to get the Arabic version of your name as a tattoo? The book includes over 120 male and female names and their Arabic translations. In total, there are a whopping 284 Arabic phrases and words to choose from. All Arabic words and phrases come in at least three different fonts. In total, there are over 15 fonts to choose from - each with its own unique flavor! This makes for a total of 1426 unique designs that you can choose from! Every single one of these tattoo designs has been researched and translated personally by myself, as well as by a professional native Arabic translator. So you can be absolutely certain that the Arabic tattoo you are getting is accurate. Have you seen my blog post on embarrassing Arabic tattoo mistakes? These mistakes are the result of relying on untrustworthy sources for translations. One such source might be a computer translation programme like Google Translate. Another such unreliable source might be your Arab friend who claims he is perfectly fluent in Arabic, while in truth he has no grasp of correct usage of Arabic grammar. 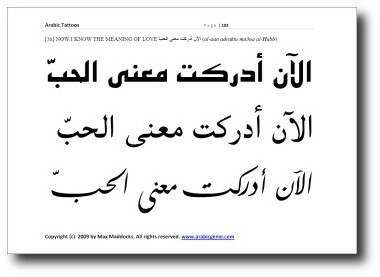 Arabic Tattoos is different, because it has been written by Arabic language professionals. I myself have many years of experience in using the Arabic language and have published dozens of Arabic tattoo translations on my blog. I am the author of The Magic Key To The Arabic Alphabet and 200 Arabic Words You Already 'Know'. In addition, I had a professional native Arabic translator verify all translations independently. This way you will feel comfortable using the tattoo designs, knowing that they are written correctly and actually make sense. What is more, I've included the actual pronunciation of every single one of the Arabic words and phrases, so that you will not only know exactly what your tattoo says, but you will also be able to pronounce it! Here are three thumbnail views of just three pages from the more than 330 pages included in the collection. As you can see, each design has its own unique style and font. It's completely up to you which design you will use to get inked. As you can see, I've included tattoo designs from almost every possible theme to make sure that there are plenty of options for you to choose from. Arabic Tattoos comes in digital format, which means that you can get your hands on the sizzling hot designs instantly. You'll instantly download it as an easy-to-use PDF file, which opens like the pages of a book on all Windows and Mac computers. It can also be printed out for ease of reading or to take to your favorite tattoo artist. 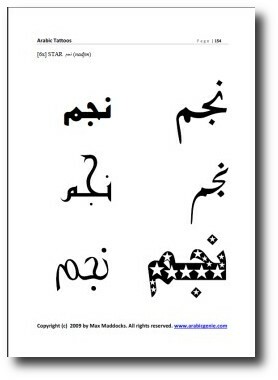 Arabic Tattoos is available now for the low introductory price of only $19.99 (USD)! You can pay from anywhere in the world. Please note that this offer is available for a limited time only and the price might go up any time. I'm so certain that you will absolutely love Arabic Tattoos that I offer an iron-clad no questions asked money back guarantee. If you feel that this book is not for you, then simply send me an e-mail within 30 days after purchase and I will personally refund the money. This means you take absolutely no risk by buying now. P.S. : You will not find such an extensive collection of unique Arabic tattoo designs anywhere else. With more than 1400 individual designs this really is a "no brainer". P.P.S. : If you have a specific tattoo idea in mind that you would like me to translate, please visit the Custom Tattoo Design page.